Manager Mark McGhee is worried Motherwell will miss out on a top six place unless they take points from Premiership leaders Celtic on Saturday. St Johnstone, Dundee and Partick Thistle can all leapfrog 'Well on the final weekend before the split. A draw at Fir Park in the lunchtime kick-off would lift the fourth-placed side out of range of the latter two. "I think if we don't take anything on Saturday, we're in trouble," said McGhee. "You can't trust anybody in this league. Everyone is capable of taking points off everyone else. "The mentality of the other three teams is good enough that they're all capable of getting wins." 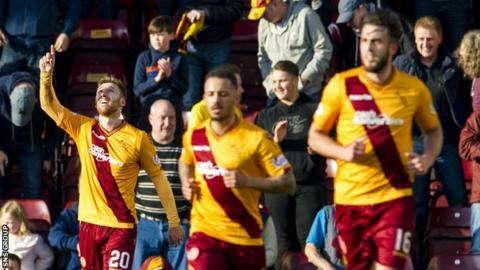 While in-form Motherwell aim for a sixth consecutive league win, Dundee visit Hamilton, Partick Thistle go to Ross County and St Johnstone visit Kilmarnock. County and Inverness CT also harbour top six hopes in a congested league table but cannot catch Motherwell. Celtic are five points clear of Aberdeen at the top, with Scotland assistant manager McGhee a former player for both sides. "I think Celtic will win the title - they'll see it over the line eventually but Aberdeen are genuine contenders," he added.